If the word 'Goa' hasn't told you yet, then let me tell you that we had a BLAST and that you need to go to that place, as that's the only reason you didn't figure that out yet. What a trip that was. The right time, the right people, the right place, it was just perfect. Its been almost three years now and I am yet to freak out the way I did at Goa. That was one trip I can never forget, and I'm sure its the same with the rest of the lot who'd come - Ranjit, Sanket, Afzal, Ritwik and Sureka. Angad, who stays at Goa, was our host, and had it not been for him and his cool parents, we'd not have had half the fun we had. The above is a photo taken using a film camera, the good old times. We (Ritwik - the one on the left, Sureka - on the right and myself, Angad and his dog - not in the picture) had gone for and evening stroll on the beach right outside his house. Finding nothing better to do, these two took to throwing shells at me! Those two were chasing me but luckily I was way ahead and instead of running, was clicking their snap ;). Well, I should've run. Anything to hit me. Well he did find the mark, Sureka that is, and that's why I said, I should've run ;). nice to remember old times. seriously when r we goin next??!! Goa rocks!and these pictures show so.The atmosphere is so totally chilled out there.Anybody who lands up there just get uplifted instantly. "Anybody who lands up there just get uplifted instantly." So true, and after the beach, that's the best part ;). nice pic.i wish i had also joined y'all. 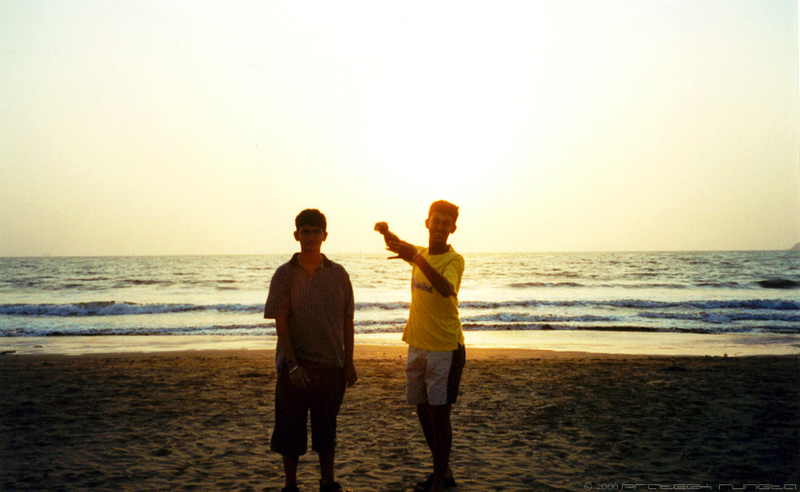 i went to goa in the 11th grade,angad was there of course. the good ole times....i miss them like hell.....miss all u guys...i'm goin bak to goa in the winter.....wen u guys comin bak der to relive the memories?? ready for it any day!